I'm running Windows 7 Ultimate (64 bit) using Visual Studio 2010 RC. I recently decided to have VS run/debug my apps on IIS rather than the dev server that comes with it. Are there any other steps I forgot to take to get this working? Notes: I installed IIS 7.5 after installing VS 2010 RC. I used the built-in "Create Virtual Directory" button under the "Web" tab in the MVC project's "Properties" in Visual Studio 2010. I made sure that the application is using the ASP.NET 4 App Pool. 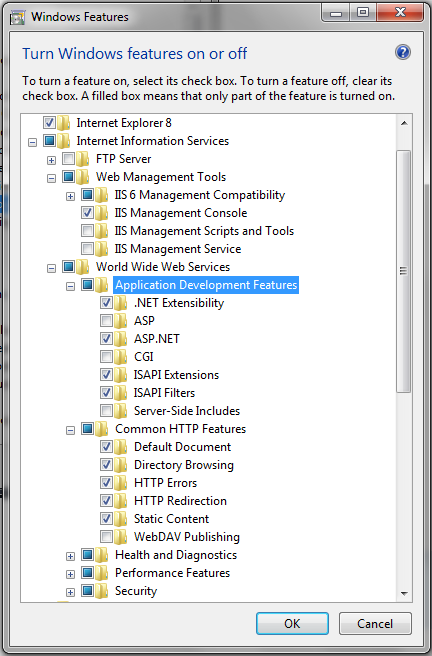 Below are the installed features of IIS I have. Another reason why someone might get this error is if the file Global.asax is not in the root folder anymore. Try installing this KB for your system. If you are seeing 404s it might be because you don't have this update -- and the isapi module just isn't getting found and there's not a lot you can do about that without this! Also u can switch AppPool to Integrated mode. Thnx to Michael Bianchi (https://stackoverflow.com/a/7956546/1143515), I only want to underline that. Now my app is working. We had a MVC application moved to a new server. .NET 4 and MVC 3 was installed, but we still got “Error 403.14″. In this case, this meant that IIS did not understand that it was dealing with a MVC application, it was looking for the default page. The solution was simple: HTTP Redirection was not installed on the server. 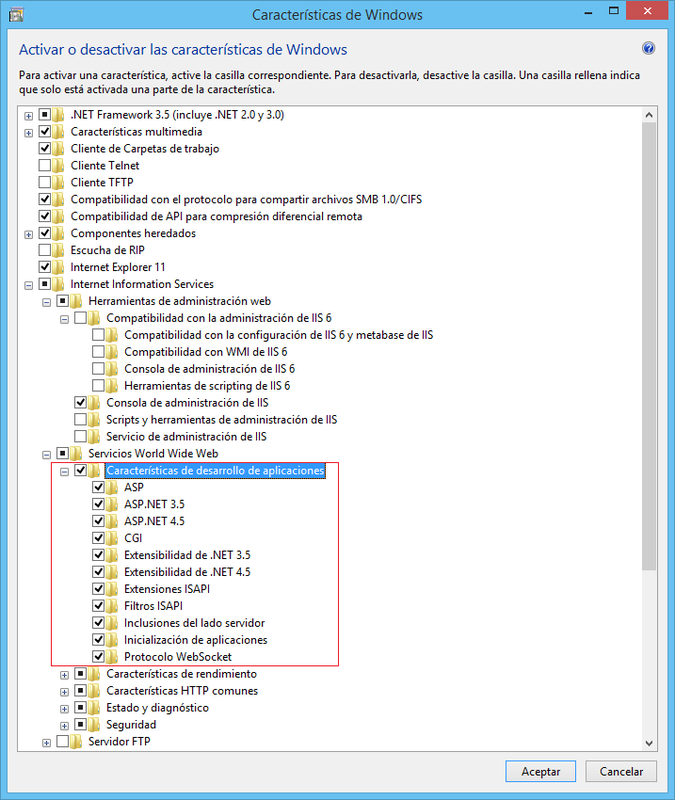 Server Manager – Roles – Web Server (IIS) – Roles Services – HTTP Redirection: Not installed. Installed it, problem solved. in the root folder of your app otherwise you could get HTTP Error 403.14 as well. Another possible solution, if you move around your global.asax, make sure the markup points to the correct MvcApplication class. Hopefully this will save someone in future. I had used the WebDeploy IIS Extension to import my websites from IIS6 to IIS7.5, so all of the IIS settings were exactly as they had been in the production environment. After trying all the solutions provided here, none of which worked for me, I simply had to change the App Pool setting for the website from Classic to Integrated. I have met the same 404.14 problem suddenly. Finally the problem had been fixed by unchecking "precompile while publishing" in the publish profile settings. Which gave me your error. Glad someone mentioned routing because I probably would've been on this forever. 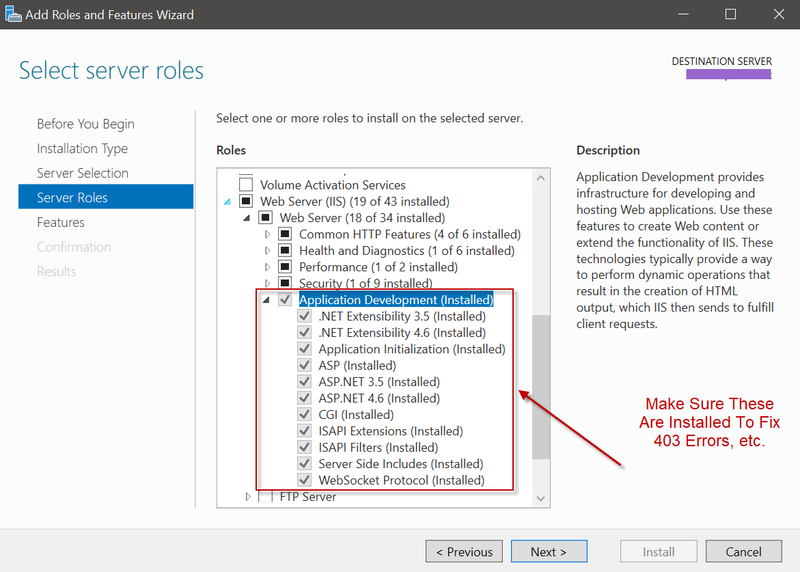 In my case ASP.NET 4.5 is not installed on the server so installing ASP.NET 4.5 fixed the issue. I had another problem that led to this issue. Obviously this removed the windows authentication module which seemed to somehow knock everything off kilter. I hope this helps someone, as this cost me most of an evening! Adding another solution for this issue. I had done these previously in a MVC2 project and it worked fine, but doing this in my MVC 3 app caused the issue reported above. Yet another reason this can happen - your RouteConfig.cs or WebApiConfig.cs are invalid. Please note for Windows 8 users you need to add/remove windows components and remove the version of .net reboot then re-install in order to register it with IIS. I presume this happens if you get .net 4.5 from visual studio and install IIS afterwards. When I first run this command, I begun getting the HTTP Error 403.14. But once I runned the command again it solved the problem. Obs: Another thing I also did was to remove HTTP Redirect from the server features in Server Management screen before reiinstalling IIS. Maybe this also had an impact in solving the problem, but I am not sure. So, if reinstalling IIS still doesn't work, please try removing HTTP Redirect and try again. Hopefully it may work for you too. // Enumerate assembly for UrlRoute attributes. I have raised this issue as a discussion on the discussion board at the IT cloud codeplex project. This worked for me and it might be useful to another one. Maybe all components required are not present or/and not all are registered correctly. In order to solve this, try to uncheck all options inside Control Panel -> Turn Windows features on or off -> Internet Information Services -> World Wide Web Services -> Application Development Features, uncheck all options and recheck all then reset the IIS and check if the problem is solved. If you're running IIS 8.5 on Windows 8, or Server 2012, you might find that running mvc 4/5 (.net 4.5) doesn't work in a virtual directory. If you create a local host entry in the host file to point back to your local machine and then point a new local IIS website to that folder (with the matching host header entry) you'll find it works then. I created a new namespace (and therefore folder) identical to the route to a controller (e.g. MvcApp/Test/SomeClasses.cs and MvcApp/Controllers/TestController.cs). This resulted also in a 403.14! For me, the solution was to add the NuGet package Microsoft.AspNet.WebPages (plus it's Razor and Infrastructure dependencies) to my web project. Infrastructure had to be forcefully reinstalled as it was not added as a reference at first. 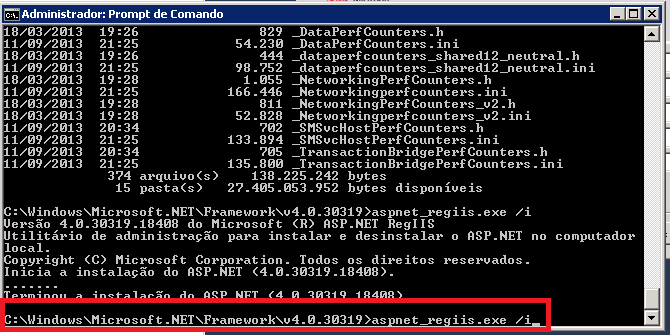 In my case .NET CRL Version in Application pool prppertires was set to No managed code (do not know why). Setting it to .NET CRL Version v4.0.30319 solved the problem. Not the answer you're looking for? Browse other questions tagged .net-4.0 iis-7.5 or ask your own question. Publish MVC app on IIS, now has error - no default document? when Make IIS7.5 Web Site an Application - Server Error in Application “DEFAULT WEB SITE”?